Every app uses varying voices, work flow styles, and types of guided meditation, so try a variety of apps to see what sticks. At the end of the day, the most important thing is that you feel drawn to practice everyday. A new study published in the Journal of Medical Internet Research sorted through hundreds of mindfulness mobile apps and ranked 23 of them. Now it'll be a little bit easier to find one that works for you. Mindfulness based programs in person have been found to be effective for reducing stress, anxiety, and depression. Jon Kabat-Zinn, the creator of the structured 8-week course Mindfulness-Based Stress Reduction (MBSR), defines mindfulness as "paying attention on purpose, in the present moment, and non-judgmentally to the unfolding of experience moment by moment." However, it's unclear if you can reap the same benefits of mindfulness programs with mobile apps. There is only one scientific study on the effectiveness of a mindfulness app (Headspace app). Users who tried the Headspace app for 10 days showed improvement in mood and fewer symptoms of depression. We rely on our smartphones more and more (25% of page views currently come from mobile devices), so it helps to figure out what apps are right for your needs. 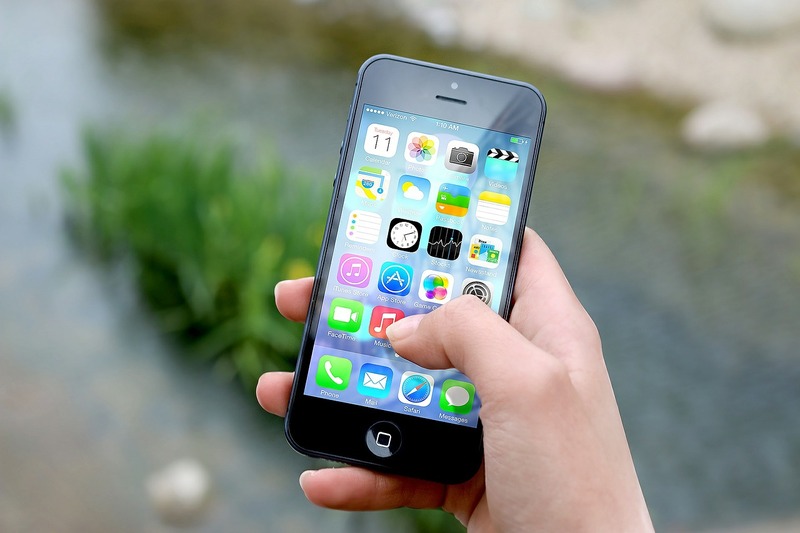 The new study ranks 23 mindfulness mobile apps using a standardized tool designed for mobile health apps called the Mobile Application Rating Scale (MARS), which rates aspects like ease of use, look, and overall satisfaction. 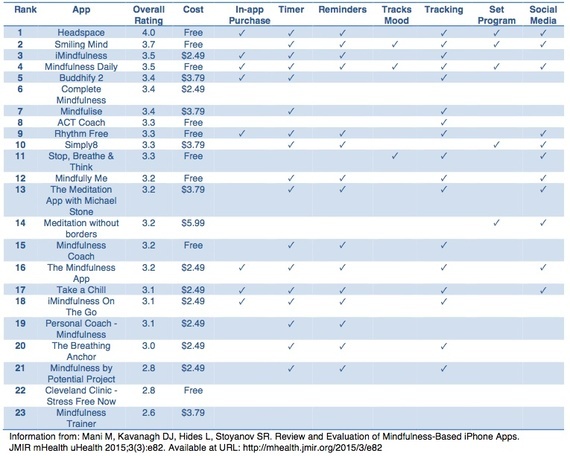 The lowest rated app was Mindfulness Trainer (Overall Rating 2.6). Check out the table below summarizing the rankings and app features to see what will work best for you. What did the apps include? Most of the apps had two or more of these exercises. What app features best fit your personality? Loves Social Media. If being connected to social media motivates you, try apps that allow you to share your experience on Facebook and Twitter like: Headspace, Meditacious, Meditation without Borders, Mindfully Me, Mindfulness Daily, Rhythm Free, Simply8, Smiling Mind, Stop, Breathe & Think, Take A Chill, The Meditation App with Michael Stone, and The Mindfulness App. Reader. If you like to learn information by reading, try ACT Coach or Complete Mindfulness. Both contain detailed in-app texts on mindfulness. Visual Learner. If you prefer not to read as much, try Headspace, which delivers information about mindfulness in the form of videos and infographics. In Touch With Emotions. If you like to track how you're feeling, these three mindfulness apps include ways to track your mood: Smiling Mind, Mindfulness Daily, and Stop, Breathe and Think. Likes to change it up for the occasion. If you want different meditations for when you're at the gym, sleeping, or on work breaks, try Buddhify 2 or Meditation Oasis (an app which was not reviewed in the study). They offer guided meditations and themed exercises based on your situation. Designer with a good eye. If you're sensitive to aesthetics, try Headspace or Smiling Mind. These two apps ranked highest in the aesthetics category. Beginner. 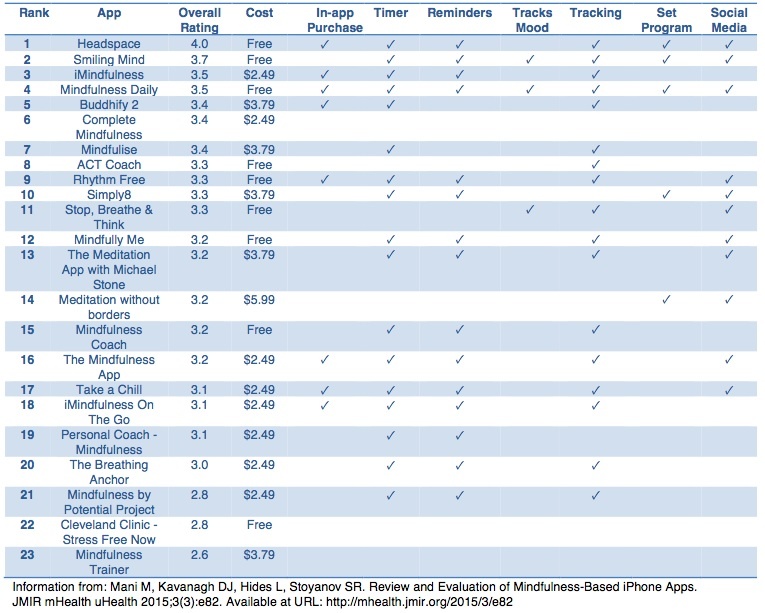 For those new to mindfulness, start with the top 4 apps from the recent study. And don't give up if the first app you download doesn't seem to work for you. You might need a different voice or interface.